Defence Secretary Michael Fallon arrived in Washington today to begin a two-day visit to the American capital. 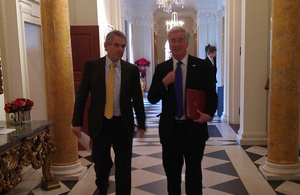 Mr Fallon began his trip with a meeting at the British Embassy with the UK’s Ambassador Sir Peter Westmacott. Tomorrow (11 December) he will hold talks with his US counterpart, Ashton Carter, which will provide an opportunity to discuss the outcome of the Government’s Strategic Defence and Security Review (SDSR), announced last month. The recent vote to extend UK airstrikes into Syria, along with collaboration in operations and industry, and the potential for further US investment in UK defence are all likely to be discussed at the talks. In addition to his meeting with Secretary Carter, Mr Fallon will tomorrow deliver a speech to a select audience of influential defence, industry and media figures at the Atlantic Council in Washington. Further meetings with chiefs of the US defence industry, think-tanks and US opinion formers will provide further opportunities for the Defence Secretary to outline the UK’s positive message. It is always special to travel to Washington and have the chance to discuss defence matters in the country that remains our closest partner in global affairs. And it is pleasing to be able to travel with a clear message, that the UK is strengthening its position on defence and taking a lead on issues that threaten our collective security. The Government’s commitment to invest in defence, highlighted by the SDSR and our pledge to meet NATO’s 2% target for the rest of this decade, shows that we will be prepared for whatever may confront us. Meanwhile the recent vote on Syria shows we are prepared to take action with our allies, and has lifted the shadow cast by the 2013 vote.